Test harnesses provide a development and testing environment that leaves the main model design intact. 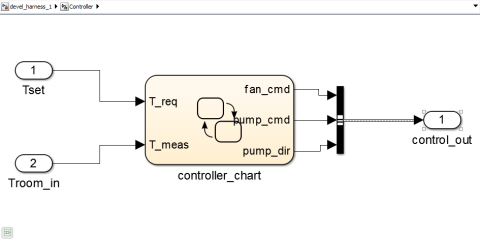 You can test a functional unit of your model in isolation without altering the main model. 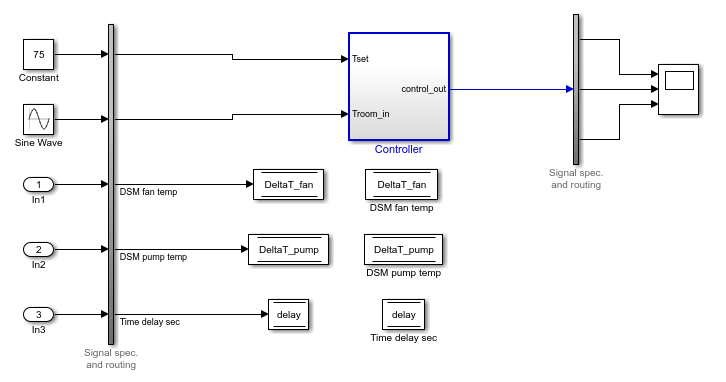 This example demonstrates refining and testing a controller subsystem using a test harness. 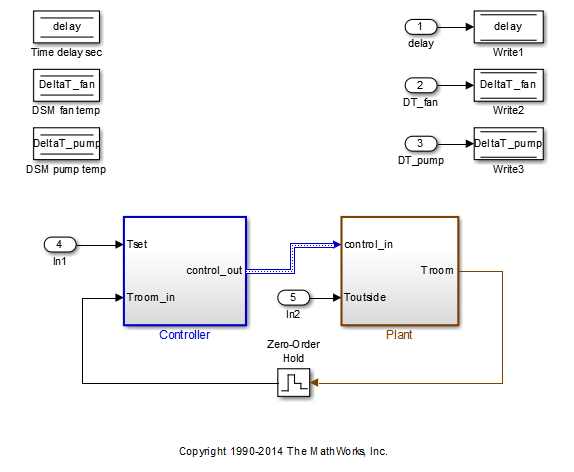 The main model is a controller-plant model of an air conditioning/heat pump unit. The controller must operate according to several simple requirements. The controller accepts the room temperature and the set temperature inputs. The controller output is a bus with signals controlling the fan, heat pump, and the direction of the heat pump (heat or cool). The plant accepts the control bus. The heat pump and the fan signals are Boolean, and the heat pump direction is specified by +1 for cooling and -1 for heating. The test covers four temperature conditions. Each condition corresponds to one operating state with fan, pump, and pump direction signal outputs. 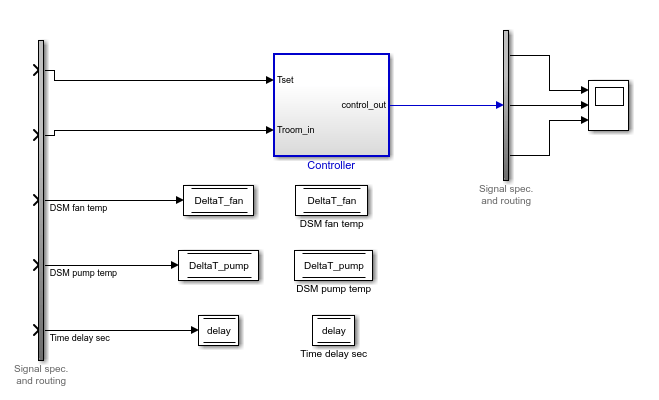 Right-click the Controller subsystem and select Test Harness > Create for ‘Controller’. 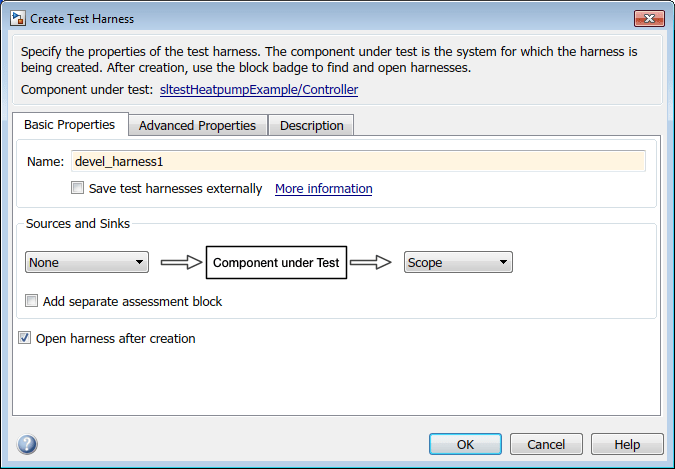 Click OK to create the test harness. In the test harness, double-click Controller to open the subsystem. Connect the chart to the Inport blocks. In the test harness, click the Save button to save the test harness and model. Navigate to the top level of devel_harness_1. Create a test input for the harness with a constant Tset and a time-varying Troom. Connect a Constant block to the Tset input and set the value to 75. 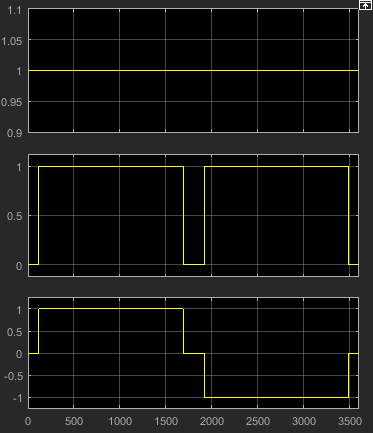 Add a Sine Wave block to the harness model to simulate a temperature signal. 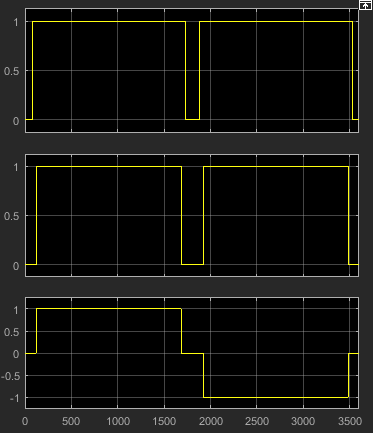 Connect the Sine Wave block to the conversion subsystem input Troom_in. Select Interpret vector parameters as 1–D. Connect Inport blocks to the Data Store Write inputs. 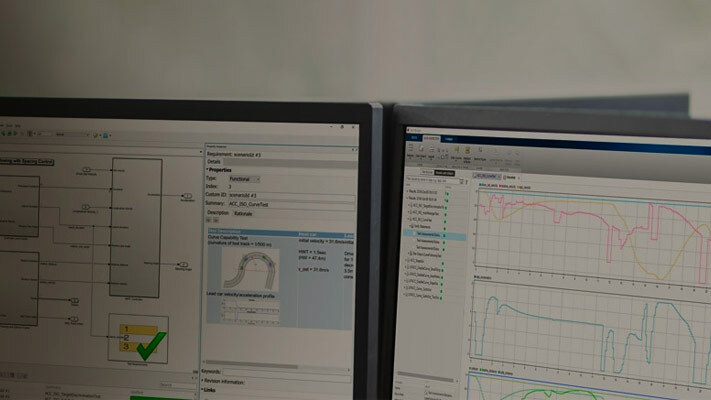 In the Configuration Parameters dialog box, in the Data Import/Export pane, select Input and enter u. u is an existing structure in the MATLAB base workspace. In the Solver pane, set Stop time to 3600. Open the scope in the test harness and change the layout to show three plots. Observe the controller output. fan_cmd is 1 during the IDLE condition where |Troom - Tset| < DeltaT_fan. This is a bug. fan_cmd should equal 0 at IDLE. The fan_cmd control output must be changed for IDLE. In the harness model, open the Controller subsystem. Simulate the harness model again and observe the outputs. fan_cmd now meets the requirement to equal 0 at IDLE.